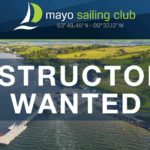 All participants must be members of Mayo Sailing Club to comply with ISA & insurance requirements. All participants need their own boat or a share in a two-person boat. Parents/Guardians should ensure the boat they supply is in good repair for the full duration of the course. a. 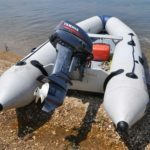 All boats have to be maintained in a safe condition before they are let on the water. b. Boats have to have a launching trolley. c. Boats must be fully insured against 3rd party and public liability claims before they can be used on the course. d. In the event of any damage on the water both parties must establish liability for repairs and have the boats ready to continue the course. a. 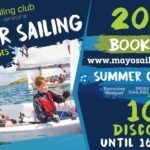 For entry level modules Taste of Sailing, Start Sailing, Basic Skills and Improving Skills we recommend Laser, Pico, Mirrors, RS Tera, Toppers, Topaz, RS Feva or Optimist. b. For advanced modules such as ABH and Racing we suggest RS Feva, Toppers, Topaz, Lasers, Laser 2 or 420. For Kites and Wires boats must have the appropriate equipment such as trapeze and spinnakers. Adventure Courses requires a two-man boat. c. For all advanced modules, participants must have their own boats or a boat to share. d. A limited number of Topazs are available for use on the entry level modules. Rates are at a charge of €50/week per sailor. These are allocated on a first come first served basis with priority given to the earlier levels. a. All sailors must have a sailing buoyancy aid type of life jacket. b. All sailors must have suitable water wear i.e. wetsuits, sailing booties (not sandals) and wind & rain protection gear. Parents/Guardians are required to provide an accurate assessment of their childs water confidence/swimming ability. There will be no formal water confidence assessment this year but water confidence will be verified by instructors during the first day of the course. 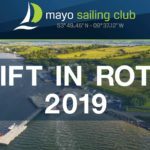 Mayo Sailing Club is an ISA approved centre. 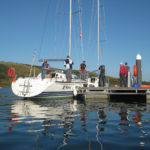 All our instructors are ISA qualified instructors and experienced sailors who have been Garda Vetted. A strict safety ratio of juniors to instructors and safety boats is maintained on and off the water. It is normal for some modules to take two years or more work to meet the appropriate skill level. We value the professionalism of our instructors. To achieve certification participants must fulfill all ISA requirements for that module. This is assessed throughout the course by our instructors and they must have the final decision in this regard.